To the drivers coming in and out of the Walmart parking lot the two men crouched under the ornamental tree were faceless. Their meager belongings spread around them, Carol DuBois knew immediately. New homeless had arrived. She had already purchased them food and drinks and had called me. I added a few more items to the emergency brown bag I kept and quickly headed out. Clean socks/tee-shirts, canned food, granola bars, hygiene items and water are staples. Depending on the circumstances it would be a very quick trip or a very long night. Father and son duo, Earl and Earl, had arrived in Enterprise at high noon today. Experience had brought them to Walmart. Another stop at a 24 hour location that offered Klieg lights for safety and the probability of nourishment. At best, a hot meal, hot shower and maybe some temporary employment. At worst plenty of dumpsters to forage in. When Carol found them it was already nearing dark. With darkness faded the well-worn trails leading in and out of thick woods. Camp should have been set up much earlier. Walking into the blackened thicket of an inhabited area, possibly stepping on someone sleeping would likely cause confrontation. Both men had faces leathery from too much sun. Some teeth were missing and what remained were yellowed. Dad wore thinned flip flops that barely covered his blistered feet. The whites of their nail beds looked like coal-miners. Their clothes were filthy. Certainly not the kind of individuals one would normally approach. Of the Walmart travelers who either gawked or avoided eye contact few had asked what they needed. But Carol had and I’m glad she did. Earl and Earl O’Shaughnessy shared painfully thin physiques and the same azure colored blue eyes. From the back they looked like twin shaggy haired surfer dudes. Affable and humble neither projected a hint of alcohol or drug use. Along with a beautiful blue point pit bull they had hitchhiked and walked, covering over 330 miles from La Place Louisiana (to Enterprise). La Place is where the elder Earl’s 77 year old mother was last thought to be. They had hitch hiked (and mostly walked) from Norman, Oklahoma to La Place to see her. Upon arriving at the familiar house she shared with her last husband - it now had an extremely expensive car parked in the driveway. Seeing it, the duo kept walking. After all it had been 8 or 9 years since they'd spoken. Maybe she had moved or married again. Each decided to disregard the possibility that she had passed on. I was given her information and asked to find out her circumstances. And then as an afterthought Earl Sr. asked me to take his picture, just in case, he said. Irene was a suspicious type and might not believe he was still alive. Also he has a daughter and some grandchildren. It’s been five years at least since he talked to her. “Call her also”, he asked. I will. A year ago the news that Norman, Oklahoma had plenty of work was found to be a rumor. Yet they stayed for a while working a busy truck stop. Thirty-three Earl Jr. was a meticulous car/truck detailer and fifty-three year old electrician Earl Sr. his best cheerleader. Failing eyesight had derailed Dad’s career. Hearing his father admit this to me caused the younger man to pull the old man close to him. I noticed the condition of the young man’s arm. It was badly deformed. That’s why he had “Junior” his service dog. A truck had clipped his arm while he was walking down the highway. His arm had been mangled. Despite his situation it was his job to care for his father. He was proud to share he and his dad were inseparable, best buds in fact. 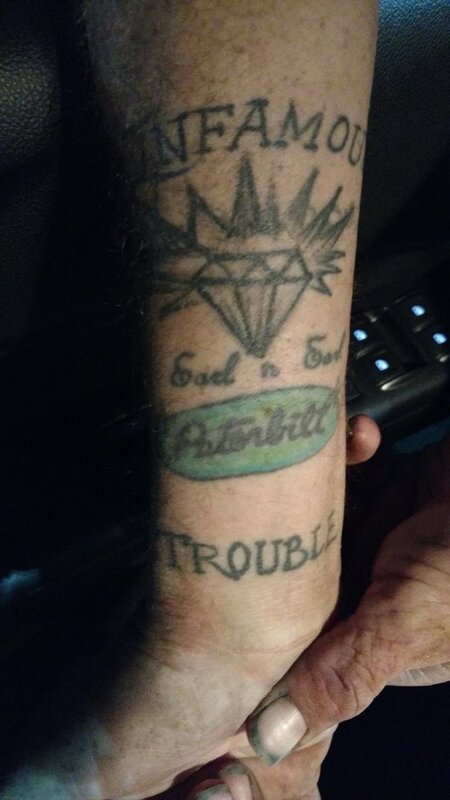 And to prove it they shared identical tattoos; INFAMOUS Earl n Earl Peterbilt TROUBLE. It was a reminder of the hit and run. Earl Jr insisted I take a picture of it. He wanted his sister and grandmother to see it. The brown bag, me and father and son now all reunited I expected the separation to be swift. I extended my hand and instantly came a hug from the old man which transitioned into him resting his head on my shoulder. I needed to tell him he had nothing to feel ashamed about. (And for that matter neither did I). Hugs followed from Earl Jr also. I was told to pass along special thanks to Carol and to “those Hand Up people who care about us”. So I am. The “Hand Up” now concluded I am painfully aware where the duo will likely pitch their tent; under a canopy of well-lit trees behind a shopping center. As I retreat those azure blue eyes say it all. In some small way integrity was restored. A tent afforded a roof. A ROOF BECAME A HOME. Another experience I shall l never forget…knowing an entire organization was standing with me making someone’s life a little better for a little while. That’s our mission. And thank you all for supporting HAND UP.